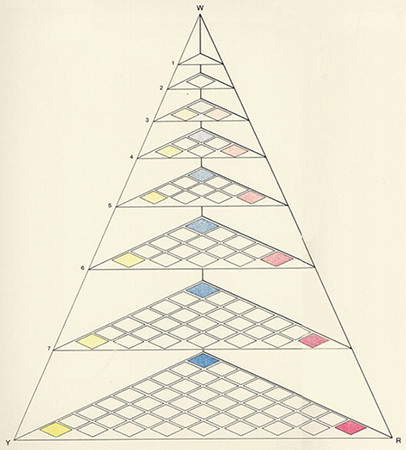 In the same year that J.H.Lambert constructed his colour pyramid and demonstrated for the first time that the complete fullness of colours can only be reproduced within a three dimensional system, another colour circle was published in Vienna by Ignaz Schiffermüller. 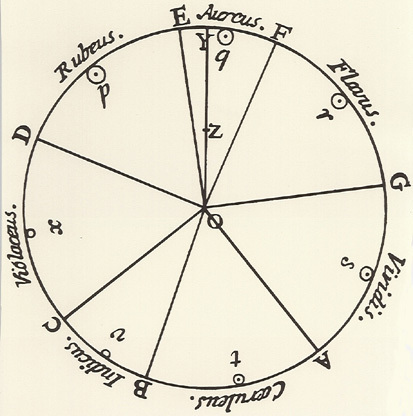 The circumference of Schiffermüller’s circle is filled with twelve colours to which he has given some very fanciful names: blue, sea-green, green, olive-green, yellow, orange-yellow, fire-red, red, crimson, violet-red, violet-blue and fire-blue. The transitions are continuous — in marked contrast to Moses Harris — and the three primary colours of blue, yellow and red are not placed at equal distances from each other; between them come three kinds of green, two kinds of orange and four variations of violet (excluding the secondary colour violet). Schiffermüller selects a total of 12 colours and thus draws upon the system originated by the French Jesuit Louis Bertrand Castel, who had published his Optique des couleurs in 1740 in order to extend Newton’s circle with its seven colours up to twelve. His choice sounds unusual: bleu, celadon (pale green), vert, olive, jaune, fauve (pale red), nacarat (orange), rouge, cramoisi, violet, agathe (agate blue) and bleu violant. Castel linked his system to music — more specifically, the twelve semi-tones of the musical scale. But whereas Castel attempted to undermine Newton’s theory and reject it, Schiffermüller’s undertaking achieved the exact opposite: his system served to illustrate Newton’s discovery that the pure colours could be arranged in a circle. The Viennese entomologist — a butterfly specialist — was one of the first to arrange the complementary colours opposite one another: blue opposite orange; yellow opposite violet; red opposite sea green. 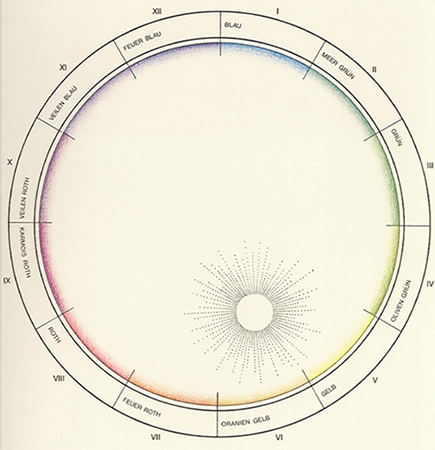 Schiffermüller also placed a sun (only suggested here) inside his colour circle in order to emphasise that he wished to show «the radiant colours» produced by nature. Whilst wishing to achieve «vivacious and gleaming colours» like the wondrous colours of the rainbow, he considered further combinations of «subsidiary colours» as aesthetically unsuitable. Date: The colour-circle was published in Vienna in 1772.